Modern designer blouses are the trendiest attires recognized and loved by women across the world. These days’ women want to look presentable and appealing in public and a designer blouse is advisable for her. Therefore, irrespective of whatever look she may have in mind for the upcoming party or the wedding function, a designer blouse is sure to help her put her best foot forward. Not just the women, modern designer blouses make a saree also look absolutely different amongst the crowd. It is therefore important to look at the saree before the blouse design is chosen so that the blouse is tailored accordingly. The style of the blouse will define the beauty of the women. These days blouses may be ready-made or stitched, to match the saree. It also seems trendy to not match the blouse with the saree. However, special attention is given to the blouse neck designs, blouse sleeve designs or the blouse back designs. Also lovely embroidery work on the blouse designs creates a whole lot of difference. Modern fashion designers also consider the skin tone and body type of a woman before choosing the color, stylish backs and necks for a blouse, in which she will look her best. These blouse designs are good for everyday wear or office wear. The style of the sleeves and neck makes all the difference in these blouse designs. Half way cut sleeves are common in this style. The U-shaped or round-shaped neck are also frequently found in this style of blouse. The front portion of this blouse design may be fully covered or can be with hooks. However, the saree draping style to match the blouse design is also very important. Every woman will look graceful as well as stunning in such blouse designs, when she drapes the saree in Gujarati style or gown style. Air hostess style saree blouse design is another favorite style amongst women who like ethnic styling in a modern way. This style was earlier common with air hostesses of Indian Airlines, however, today it is fashionable amongst normal ladies too. In this style, the back is covered up, while the front is hooked or buttoned, thereby giving an elegantly fashionable appeal to the women. Sleeveless Blouse Designs always top the list of modern women’s choice. Usually made out of cotton, these blouse designs make a comfortable wear for the summers. 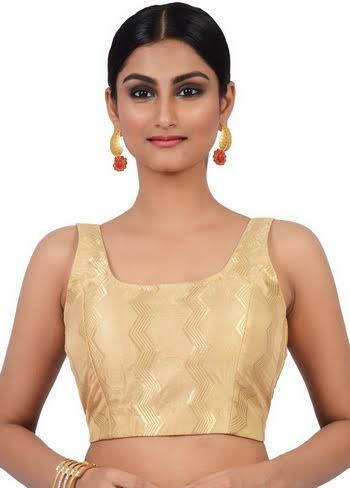 However, sleeveless blouse designs with necks cut in different styles worn preferably with lovely chiffon sarees, are in great demand these days to make her look extremely stylish during formal parties or other casual functions. The backless blouse designs have come a long way from the long sleeves to short sleeves. With sequin and zari work, the backless designs look very fashionable to suit the evening parties. Smock style blouse designs usually have connection with the roots. However, with innovations in designs, modern designers have upgraded the traditional designs to make it perfect for the modern women. V-neckline with smock style waist, for instance, will work wonders for the women who want to look traditionally fashionable during traditional occasions or wedding functions. Structured Blouse Designs are the most preferred choice for the women, because of the style and comfort that comes with this designer blouse. This attractive piece will suit any occasion, and will set her apart from the crowd. Cami blouse Designs are found embellished with gorgeous and complicated designs, making it perfect for the women, who are always fishing for complements and seeking attention at parties or whenever they are going out. Ruffled Blouse Designs with long sleeves are perfect choice for those women who choose to be sophisticated and elegant during special occasions. The basic blouse designs, worn for pleasure or for business purpose, have always created a popular statement in a woman’s wardrobe. Modern women, however might get just one or two designer blouses for those special occasions. 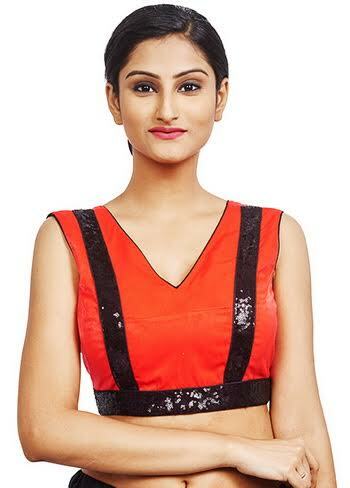 But the latest saree blouse designs are made to match the style statement of the modern women. PS: Content sponsored by brand.